Last week charter schools received a windfall to the tune of tens of millions of potential dollars in free space, either in a public school or in a city-subsidized private space, more per pupil funding than public schools, and an essentially unfettered ability to expand at the expense of existing public schools. The financial burden of providing and paying for charter school space and services for co-locations will be crippling. This will be especially difficult once the cap of 200 charter schools is reached. There are 52 charter schools left on the cap in NYC, but there will be “more” because existing charters can expand grades without being included in the cap. So, for example, if a charter opened as an elementary, it can expand to include middle school and/or high school grades without a cap deduction. In addition, the Cuomo-led legislation to provide space to charters — only in NYC — is an unfunded mandate. The city is required to find the resources to pay. Only after $40 million is spent on private charter rent, will the state contribute to an undetermined amount of assistance. We need funding policies that will support the facilities and space needed for the approximately 94%[i] of public school children learning in overcrowded and substandard facilities. Charters schools receive MORE per pupil funding than public schools. This creates even greater inequity in our school system favoring the approximately 6% of NYC’s school children who currently attend charter schools. Combine that with the millions in private funding charters receive from millionaire and billionaire donors who have an interest in privatizing our education system and the goal becomes clear: undermine and dismantle every child’s right to go to the school of his or her choice. The new policy will force students fill out an application, win a lottery, and adhere to undemocratic governance and a set of rules that leave families vulnerable to discrimination and push-out, not to mention increased segregation in an already segregated school system. We need policies that seek to create equity and increase the integration of our school system, not make it worse. The language in the budget seems to suggest that an existing charter in a public school cannot be prevented from expanding, which it will do at the expense of the existing public school. We need policies that seek to expand our existing public schools. There are many more public schools serving ALL of NYC’s children well and those schools and their best practices should be held up as models. Charters, by contrast, serve far fewer of our neediest children while boasting achievement numbers similar to public schools. The overwhelming majority of New York City families choose public schools and their rights should be respected and protected. They should not be forced into charters. The financial sustainability of our school system is at risk. As more public dollars are funneled into education corporations and charter schools, fewer public dollars are available for our public schools. At a certain point, and I have heard the “tipping point” is 10% enrollment in charter schools in NYC, we will reach a financial crisis that will make it impossible to balance the funding needs for both charters and public schools, thus allowing the kind of wholesale transfer of public schools to charter operators as we have seen in New Orleans and Philadelphia. Legislators from around the state, save a brave few such as my own state Senator Montgomery and Harlem’s Senator Perkins whose constituents have experienced the horrors and inequity of charter co-locations and expansion first hand, said precious little and took no stand in rejecting this budget. Our own United Federation of Teachers did not mount a fight back against this. In fact, their poor policy choices have made it difficult for UFT leaders to do since they have co-located two union-run charter schools themselves. New York Communities for Change has withdrawn its participation in the parent-led co-location lawsuit, a lawsuit that seeks to charge charters rent for use of public space — a policy that will now be illegal in New York City if the provision in the state budget is not changed. The true student-lobbyists, parents, students, rank-and-file educators and community members, must stand together to demand full funding and support for our public schools. We must make it clear that an investment in a system that serves ALL children that is governed by the people (however flawed in a system with mayoral control), not private unaccountable and non-transparent interests, is vital to the health and success of our children. We must stand together and demand the schools our children deserve: facilities deserving of the wealthiest nation in the world, rich and well-rounded curriculum and services, experienced and supported educators, smaller class sizes, and the right to attend a neighborhood public school that is excellent AND open to all. My school community experienced co-location first hand. We were fortunate to mount a fight back that ended our co-location. However, that win was bitter sweet, because the charter, PAVE Academy, was awarded more than 20 million dollars in precious capital funds to build its own building in our neighborhood. We also engaged in a less-known fight back for another charter expansion in our neighborhood, a charter that sought to further segregate the neighborhood by creating a “boutique” charter targeted at the gentrifying population of Red Hook. Thankfully that charter was not approved. We have learned from both of these experiences that charter space support and expansion in communities results in a negative impact on the community itself, causing unnecessary strain and tension, as well as on the existing schools, and in our case, a school that was and is a high quality option. But equally important, because these issues were at our doorstep, we also understand the deep systemic issues surrounding charters: the drive to privatize our public education system, the impact of charter push-out, the impact of a two-tiered system where one school is privileged over another, and the bigger picture of the undermining of public education and all that entails from worker protections, to funding, to the way children are treated. MORE stands in solidarity with the approximately 94% of families who want high quality neighborhood schools for their children. We cannot achieve the promise of public education if the funding, facilities and services we need to provide are at-risk. 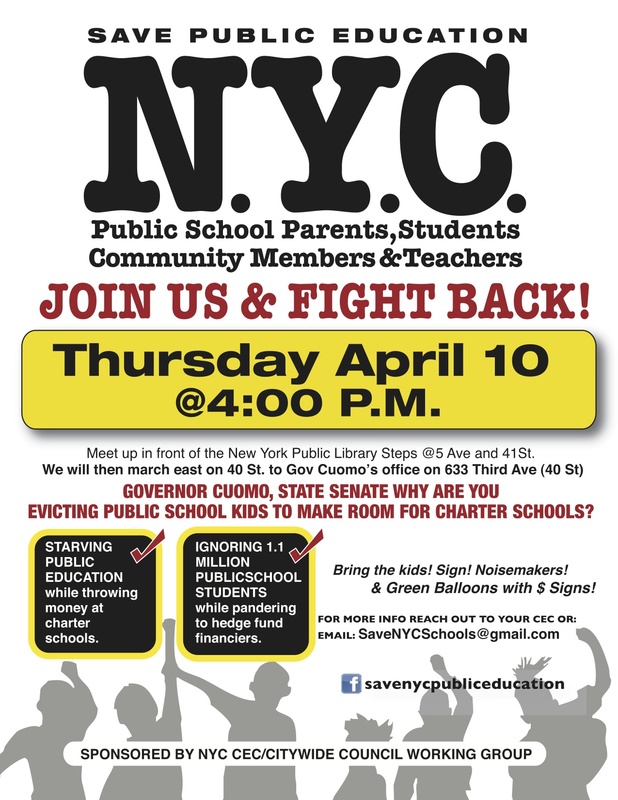 Please join us and families across the city and send Governor Cuomo a message this Thursday: you are not our student’s lobbyist. You do not stand for children. You stand for your own political interests fueled by charter school dollars and we will hold you accountable! [i] Charter school enrollment in 2011-2012 was 47,780 (according to www.nycsca.org’s report for capital fund projections) out of approximately 1.1 million school children in New York City., yielding an approximate 4% enrollment in charter schools at that time. Cited numbers currently range from 3%-6%. The New York City Charter school Center states approximately 70,000 children attend charter schools in NYC . Based on this information this post estimates current charter enrollment at 6% and public school enrollment at 94%. Well done. I experienced first hand the inanities of our political (mis)representation in my Quixotic adventure in the NYS Regent selection process.